To download a high resolution 'A4' or 'USA Letter' Charles Haddon Spurgeon (C H Surgeon) print click on the links below the Charles Spurgeon image. The watermark does not appear on the Spurgeon print. 'Charles Haddon Spurgeon 1834-1892 The Prince of Preachers' by Billy. Taken from Billy's original pencil sketch. Part of a private collection. The watermark 'www.billyart.co.uk © Billy 2009' does not appear on the downloaded Charles Haddon Spurgeon print. "You are very talented--love the Spurgeon. If I had your talent I would be using it on the streets too." "I am delighted to heartily recommend the Art of Billy to you. Billy's dedication to Christ is as passionate as his artist hand is skilled--evident to all who meet him or see his work." "Very excellent by the way, one of the best pictures of Spurgeon I’ve seen. God has given you a wonderful talent!" "Charles Spurgeon is one of my heroes of the faith: a big man, who trusted a big God, who in turn did big things through him. Your sketch brilliantly captures something of his 'big' character. Thank you Billy!" "That Spurgeon print is fantastic. The story I know of him and the trainee preacher preaching on the armour of God now comes to real life for me." Rob Johnson MLP Snaith & Selby Circuit. Become a 'fan' of Billy the Artist's work on Facebook and tell your friends. 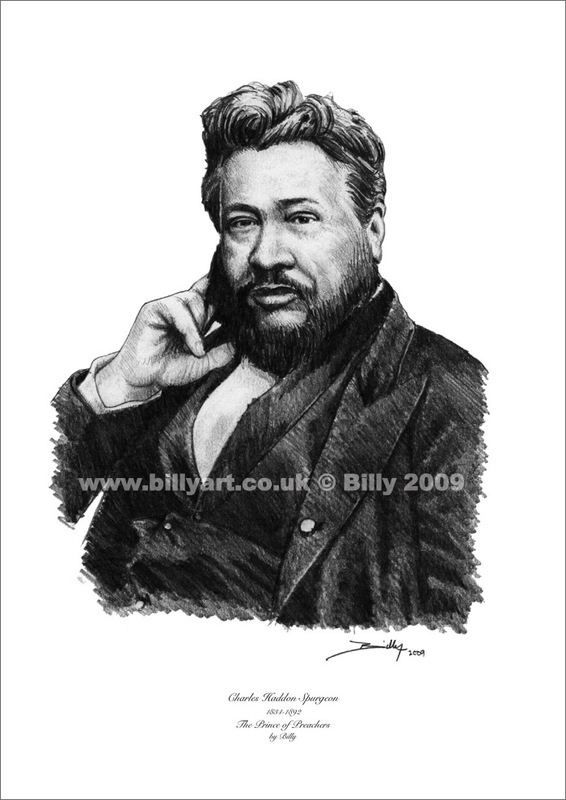 This free Charles Haddon Spurgeon print by Billy is available in two sizes, A4 and US Letter. Click the links below to download the PDF file of your choice. The Charles Spurgeon PDF's were outputted at the 'Best' quality and are a 2 meg file. So when you print them at home you can set your printer to its highest output if you would like to get the best quality results for your free Charles Spurgeon print. The original Charles Spurgeon pencil drawing by Billy the artist was produced on Daler Rowney 150gsm Cartridge Paper 'Red and Yellow' spiral sketch pad. Hahnemühle produce a variety of high art printer papers and canvases for your inkjet printer to print your free Charles Spurgeon fine art print by Billy on. To download your free Charles Spurgeon print by Billy alt click (or cntl click) for Mac users. Right click and save target as for PC users. Charles Haddon Spurgeon by Billy is licensed under a Creative Commons Attribution-Noncommercial-No Derivative Works 3.0 Unported License. Full Terms and Conditions for the Charles Haddon Spurgeon Print by Billy are at the bottom of the page. Contact Billy the artist with your comments and thoughts about his drawing of 'Charles Haddon Spurgeon - The Prince of Preachers' and let him know where his drawing of Charles Spurgeon has got to and how you came across it. Billy next to a foundation stone laid by Charles Spurgeon at Trinity Road Chapel Baptist Church in London. Spurgeon gave £250 to help plant and build the church in Wandsworth. Billy the artist had an exhibition of work there in the 'Paterson Room' in February 2009. See Billy's Exhibition page for more information about that event. Charles Haddon Spurgeon (C H Spurgeon) was born on June 19th 1834 in Kelvedon, Essex, England. Spurgeon was saved (converted to Christianity) in a little Primitive Methodist Chapel in Colchester on January 6th 1850 that the main preacher couldn't get to because of the snow! There were 10-15 people (Charles Spurgeon's words) and a thin man (not a minister) preached from the text 'Look unto Me and be ye saved, all the ends of the earth.' Isaiah 45:22. Charles became a Baptist on May 3rd 1850 and was baptized in the River Lark, at Isleham. Spurgeon preached first sermon at a cottage in Teversham in 1850 and Spurgeon was a devoted street or open air preacher. Spurgeon later preached to 10,000 people on Clapham Common! Charles Spurgeon certainly had big lungs, all this without a PA system! Charles Spurgeon then became the minister of Waterbeach Baptist Chapel in October of 1851. This then led to Spurgeon being invited to preach at other places. Though not much stopped Spurgeon preaching open air anyway! Charles would find a field wioth a few people and he would preach about Jesus and salvation. This led to Charles Spurgeon being invited to preach at New Park Street Chapel in London on December 18, 1853. The small congregation were astounded at this new preacher’s message and word got around of the amazing preaching of Charles Spurgeon from that first sermon. The New Park Street Chapel asks Spurgeon to be their pastor and on April 28 1854 Charles takes his appointment as their minister (then 232 members). The New Park Street Chapel was also the place where the future ‘Mrs Charles Spurgeon’ was to be found. Miss Susannah Thompson and Charles Spurgeon were married on January 8 1856 and they had twin boys, Thomas and Charles born on September 20th 1956. The New Park Street Chapel congregation under Spurgeon’s miinistry and preaching grew extensively and the Metropolitan Tabernacle Building Committee was formed in June 1856 to accommodate the growing body of believers. Charles Spurgeon also had a passion to train other ministers and evangelists and set up the Pastors' College in 1856. This training facility grew and was posthumously named ‘Spugeon’s College’ which is still around today. The Metropolitan Tabernacle opened with a great prayer meeting on March 18th 1861 and Spurgeon preached his first sermon there on March 31st 1861. Charles Spurgeon’s fame as a preacher grew internationally with his sermons being recorded and printed in numerous papers and books and garnering Spurgeon the title ‘The Prince of Preachers’. 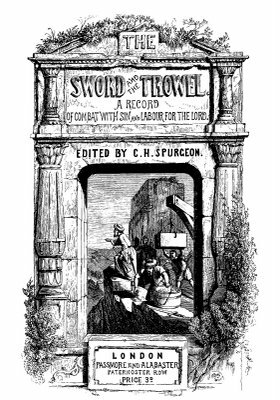 Spurgeon published his own paper ‘The Sword and the Trowel’ as well as many other books on theology and preaching. Susannah Spurgeon set up a ‘book fund’ that supplied ministers with theological books that they would otherwise struggle to afford. Charles Spurgeon’s ministry also included an orphanage and education for many of the under privileged in society which led to the ‘Polytechnique’ schools across the UK and many other things. Through all of Spurgeon’s work he acquired a lot of money but gave away around 80 percent of his income to the ministries that were associated with him such as the orphanage, pastors college or schooling! It is reckoned that Charles Spurgeon preached the gospel of Jesus and salvation live to over 10 million people! All that without a PA system or podcasting! Take into accout all of Spurgeon’s published sermons, which are still read and loved today by millions, Spurgeon could be one of the world’s most prolific preachers of Jesus as the only way to salvation (Along with the likes of Paul the apostle, George Whitefield, John Wesley, Billy Graham and many more). 14,692 people were admitted and baptised into membership at the Metropoliton Tabernacle under Charles Spurgeon’s leadership. Many thousands more became members of congregations that Spurgeon planted through his minister training college. Not only that but hundreds of thousands, if not millions, today are still saved and blessed through Charles Spurgeon’s preaching through podcasts of Spurgeon’s sermons, websites like the ‘Spurgeon Archive’ that have all of his sermons on line, ‘Morning and Evening’ daily devotional book by Spurgeon or Charles’ other daily devotional book ‘The Check book of the Bank of Faith’ being bought for them as a gift. Just amazing. 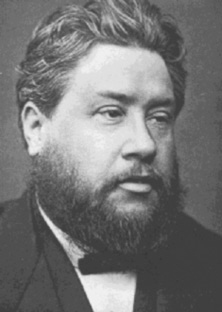 Charles Haddon Spurgeon died on January 31st 1892 and went home to be with his precious Lord and Saviour Jesus. There are many more detailed accounts of Charles Spurgeon’s life published online and in print and are well worth a read to see how Jesus inspired Charles Spurgeon to be the man that he was. You may download this Charles Haddon Spurgeon Print by Billy and print it off for your own use and pleasure or to give as a gift to a family member, friend or colleague. This Charles Haddon Spurgeon print by Billy must not be reproduced for commercial resale purposes in any form. If you are charged for this image then please report the infringement use to your local trading standards office and Billy. The Charles Haddon Spurgeon image may be used in magazine or web articles if talking about Billy the Artist and his work or if letting others know about the free Charles Haddon Spurgeon print. Always credit Billy as the artist of 'Charles Haddon Spurgeon The Prince of Preachers' pencil sketch with a link to the free Spurgeon print page URL at the bottom or a direct link to Billy's website home page if space doesn't allow. DO NOT post the Charles Haddon Spurgeon print to be downloaded from any other site. 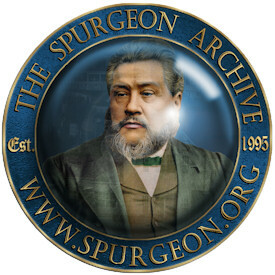 ALWAYS put a link to the Charles Spurgeon download page on Billy's website. URL link to the Spurgeon page below. The Charles Haddon Spurgeon print by Billy is for personal and non commercial uses only. Contact Billy if you wish to use his Charles Haddon Spurgeon image commercially for any reason.